UPDATE: Lawrence Wright’s publisher was forced to correct in the paperback version nearly a dozen inaccuracies revealed on this website. Basic fact checking would have prevented errors like claiming a Church was shuttered when it is alive and well. It also is noteworthy that Wright’s book has gone unpublished in the UK after his publisher there was made aware of the book’s errors. Wright’s failure to vet a preposterous anecdote about a bank robbery that never occurred. Wright’s source spun a tale about a Scientologist bank teller, but no records or accounts exist that such a robbery even happened. The source turns out to be a suspended and sanctioned lawyer once declared by a court to be a vexatious litigant and his client, who has recanted past stories spun to the media about equally preposterous claims. One of those claims involved having family members die at the Jonestown mass suicide, which he later admitted he fabricated. What’s more, Wright could have and didn’t check FBI records. Since the FBI has jurisdiction over all bank robberies and keeps extensive records of each and every robbery, he would have discovered the robbery never happened and his anecdote was a myth. Wright’s claim that the Church owns “schools” and “banks” in Clearwater and lists Church of Scientology of New York as one of the “recent” acquisitions. The Church does not own “schools” or “banks” in Clearwater or anywhere. And the Church of Scientology of New York was not recently purchased but acquired more than three decades ago in 1979. Wright’s reliance on a source who has had no contact with Scientology since 1959 and who publicly retracted his claims under oath in May and July 1987, including admitting that his allegations were flights of fantasy and the product of his own imagination. 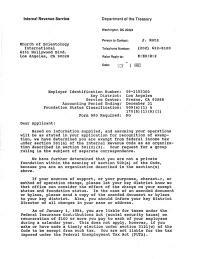 These statements concerned the years in which Dianetics and Scientology were under development and were critical underpinnings to Wright’s narrative. Wright claimed that the source recanted the recantations “five years later.” One small problem: the source passed away on September 16, 1991 and was obviously not issuing statements from the grave “five years later.” His 1987 recantations remain his final word on the matter. This website provides the facts Lawrence Wright ignored so that readers can decide for themselves. Mr. Wright's book is so ludicrous it belongs in a supermarket tabloid. 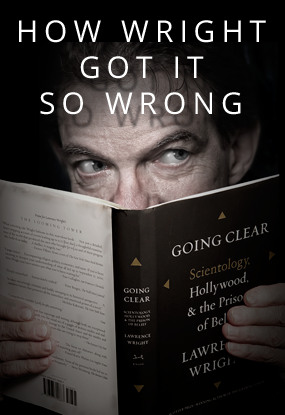 The book is an error-filled, unsubstantiated bigoted anti-Scientology book. The Church has produced a white paper to identify some of the more than 200 errors so far discovered in Mr. Wright’s book. British and Canadian publishers have already chosen not to print it, which speaks volumes about their confidence in its factual accuracy. When Mr. Wright’s bias was pointed out to him, he falsely accused the Church of bizarre actions based on not a single fact and went silent when asked to support his accusations. Lawrence Wright showed the Church he had no interest in the facts, only the lies and exaggerations being fed to him by angry, bitter sources with agendas based on hatred and revenge. The result is a biased work, more fiction than fact. Removed for malfeasance more than a decade ago, Marty Rathbun admitted lying to the media about the same allegations made in the book and admitted to a newspaper to suborning perjury and obstructing justice. Mike Rinder is also on record contradicting himself, asserting that the very same allegation he alleges to Mr. Wright was “rubbish” to another media and when questioned on network television, “If you lied before how do we know you’re telling the truth now?” Rinder responded, “You don’t.” He, too, was removed from the Church for malfeasance. Marc Headley provided three different versions of the same tabloid gossip story. He also made wild allegations in a federal lawsuit against the Church that a judge tossed out of court, but not before admitting under oath to twice selling stories to tabloids. The judge ordered Headley and his wife to pay $40,000 to the Church to cover its legal costs in defending against such a frivolous lawsuit. These and other sources were practically held up as paragons of virtue. The book claims that a Scientologist who was a bank teller says he was told to comply with a robbery in order to pay off his debt to the Church (the robbers taking $4,000). Per his end notes, Mr. Wright attributes this story to Garry Scarff, someone with a major credibility problem. Scarff was never a Scientologist and is better known per published accounts as the person who “reinvented himself during the late 1980s as a surviving member of the Rev. Jim Jones’ Peoples Temple. He claimed to be a victim having allegedly lost his father, his fiancée and his eight-month-old son… However, by later admission, all of his Jonestown claims were fraudulent. Neither Scarff nor any member of his family were ever involved…” Mr. Scarff admitted he is an inveterate liar under oath (and coincidentally two of the above sources are well aware of these facts and more). As for the supposed bank robbery, there are no public records, no news accounts, no bank teller and no one has ever heard of this incident. Mr. Wright claims that L. Ron Hubbard wrote his parents out of Mr. Hubbard’s biography. A review of the 16-volume biographical encyclopedia (of which Mr. Wright is familiar and claims to have read in part) shows photographs of Mr. Hubbard’s parents and Mr. Hubbard’s own words about them. The most surprising was the claim that Mr. Wright interviewed something like 200 Scientologists—past and current. When the Church checked the list, only about a dozen are current Scientologists, none of whom were interviewed for the book. Wright describes Paul Haggis as having reached the level of “OT VII, which was the peak at the time.” Within a year of Haggis supposedly reaching “the peak,” in 1977, L. Ron Hubbard released many new levels of spirituality and continued to refine his research for nine more years. Paul Haggis availed himself of none of this material. Thus, the lens through which Wright viewed the Church of Scientology was confused, distorted and out of focus by more than three decades. Wright’s first publication of his profile on Paul Haggis was in the pages of The New Yorker in February 2011. The Church of Scientology’s Freedom magazine has dissected this profile and its many factual errors, as well as Paul Haggis’ pretence of even calling himself a Scientologist after being absent for so long. The results of that research are available here: www.freedommag.org/special-reports/new-yorker.html. The establishment of all-digital, print-on-demand, religious publishing facilities in Los Angeles, California, and Copenhagen, Denmark. Combined, these facilities can now publish up to 500,000 books and 925,000 CDs per week. The acquisition of our soon to be Scientology religious television broadcast facility in Los Angeles. On top of ignoring all of the above, Mr. Wright avoided the thousands of Scientologists and non-Scientologists around the world who are involved in our humanitarian initiatives and social betterment programs reaching millions of people all over the world in the fields of drug abuse prevention and rehabilitation, education, criminal reform, human rights and morals education. People all over the world embrace the Scientology religion because of the workability of L. Ron Hubbard’s discoveries about the mind, the spirit and life and the Church is set to service them all. Lawrence Wright concedes that “there is no point in questioning Scientology’s standing as a religion, (page 359)” citing to the 1993 determination by the Internal Revenue Service of the charitable status of Scientology churches. The facts go far beyond Wright’s cynical observation. By any measure, Scientology is fully developed in its theology, religious practice and organization, the generally accepted criteria of the definition of a religion. The breadth and scope of the religion includes more than 11,000 Churches of Scientology, Missions and affiliated groups in 184 countries, all unified by a common religious goal. Millions of Scientologists around the world believe in freedom of religion and the religious tenets and practices of Scientology. For every one of these individuals, Scientology is their religion. This is the most important test of any true religion of the world—indeed, it is the test used by the United States Supreme Court and high courts in many other countries. The Scientology religion is accepted as such throughout the world. In a handful of countries, the Church has been forced to litigate the issue of its religiosity. Inevitably, the Church has prevailed in these cases and its religious nature has been unequivocally recognized. Some of these decisions, including decisions by the Cassation Court in Italy and the High Court in Australia, are now considered by leading scholars and judicial authorities to have established the standards for religious recognition that all religions must meet. Scientology is a unique contemporary religion—the only major religion to emerge in the 20th century and to continue to grow in the 21st century. Key international religious recognitions of the Church of Scientology are detailed below. In the United States of America, every Church of Scientology, Scientology Mission, and all related social betterment activities are recognized as organized exclusively for charitable purposes and tax-exempt. 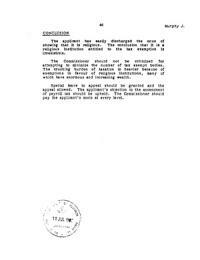 Following a two-year examination of unprecedented scope and depth, encompassing all the Church’s worldwide operations, the US Internal Revenue Service issued ruling letters on October 1, 1993, recognizing the tax-exempt religious and charitable status of the Church of Scientology International, the Mother Church of the Scientology religion, and 150 affiliated Churches, Missions and social betterment organizations—all distinct and separate Scientology-related entities, each recognized in its own right. The IRS also recognized the charitable and religious status of the International Association of Scientologists, a membership organization open to all Scientologists from all nations. In this historically exacting review, conducted under the supervision of the most senior government officials responsible for exempt organizations, the IRS concluded that the Church is operated exclusively for religious and charitable purposes. The US IRS’ ruling establishes that: 1) Scientology is a bona fide religion; 2) the Churches of Scientology and their related charitable and educational institutions are operated exclusively for recognized religious purposes; 3) the Churches of Scientology and their related charitable and educational institutions operate for the benefit of the public interest rather than the interests of private individuals; and 4) no part of the net earnings of these Churches of Scientology and their related charitable and educational institutions inures for the benefit of any individual or non-charitable entity. The IRS also determined that the Church of Scientology qualifies as a church under criteria that require the existence of an established religious doctrine, religious literature and religious history, the qualification and ordination of ministers and a religious community of believers. Scientology Ministers are also entitled to immigration status as clerics by the US State Department and US Citizenship and Immigration Services (formerly Immigration and Naturalization Service) decisions finding that Scientology is a bona fide religion. Scientology is officially recognized as a religion throughout the United States by federal, state, and local governments. Scientology is recognized as a religion throughout Europe. 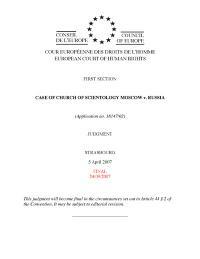 On April 5, 2007, a landmark decision rendered by the European Court of Human Rights found that Scientology constitutes a religious community, enunciating a principle binding on all 47 member states that compose the Council of Europe. In Spain, the Church obtained full religious recognition. 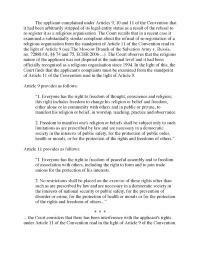 On October 31, 2007, the National Court in Madrid issued a unanimous landmark decision affirming the right to religious freedom in Spain by recognizing that the National Church of Scientology of Spain is a religious organization entitled to the full panoply of religious rights that flow from entry in the government’s Registry of Religious Entities. Scientology has also been formally recognized as a religion in the following countries: Albania, Australia, Brazil, Costa Rica, Croatia, the Dominican Republic, Ecuador, France, Hungary, India, Kazakhstan, Kenya, Kyrgyzstan, Nepal, New Zealand, Nicaragua, the Philippines, Portugal, Scotland, Slovenia, South Africa, Sri Lanka, Sweden, Taiwan, Tanzania, the United States, Venezuela and Zimbabwe. The only thing “clear” about Lawrence Wright’s book is that he is carrying water for a handful of angry, bitter individuals. Excerpts from October 1983 decision on the Australian High Court.